Three Catalan architects who have built little outside Catalonia have been named as the 2017 winners of the Pritzker prize, the world’s most prestigious architecture award. For a glamorous gong that is usually bestowed on star architects for galleries and opera houses, it is a radical departure to see it awarded to an unknown trio who have spent the last three decades quietly improving their own area, designing beautifully made buildings from a converted foundry near the Pyrenees. 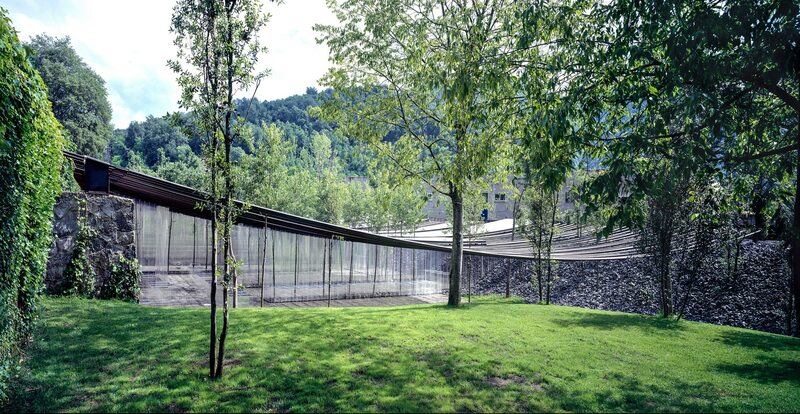 Rafael Aranda, Carme Pigem and Ramon Vilalta, who founded their practice, RCR Arquitectes, in the small town of Olot in 1988, have built a reputation for projects that have an acute sensitivity to local context, taking great care with how they are sited in the landscape and masterfully using materials to play with light, shade, mass and fragility. “They’ve demonstrated that unity of a material can lend such incredible strength and simplicity to a building,” says Australian architect Glenn Murcutt, chair of the Pritzker jury, himself known for buildings that touch the ground lightly. “The collaboration of these three architects produces uncompromising architecture of a poetic level, representing timeless work that reflects great respect for the past, while projecting clarity that is of the present and the future.” (Oliver Wainwright, The Guardian, 1st march 2017). The trio work in an early 20th-century foundry building in Olot, which they have converted with their usual light touch, transforming the “as found” brick shell with precise steel insertions, the metal’s surface variously brute and rusty or varnished and shiny. They work together at a big table of their own design, gliding around the office in slippers, enjoying a slightly cultish air: their projects are so precise and well-made that it is (apocryphally) rumored they ask their clients to sign a contract pledging never to alter their buildings. “It is true that we take things to extremes,” says Vilalta, explaining that they often design the furniture, too, because they struggle to find satisfactory off-the-peg designs. Their El Petit Comte kindergarten, built in Besalú in 2010, also ditches conventional walls for a kaleidoscope of colorful tubes, arranged in a linear rainbow around the perimeter of the building like kids’ coloring pencils. Some of them are solid and structural, others are transparent and left free to rotate, inviting children to play with the fabric of the building. There are no corridors, dark corners or residual spaces; every room overlooks the outside, protected by this colorful palisade. Recent years have seen the architects venture outside Girona, completing two projects in France in 2014 – the Soulages Museum in Rodez, composed of stark Corten steel blocks cantilevered over a sloping landscape, and La Cuisine art center in Nègrepelisse, an elegant renovation and extension of a 13th-century fort. The choice to highlight this locally rooted trio, who have avoided the international limelight, represents a promising direction for the Pritzker jury, who this year canvassed more opinions and cast the net far wider than previous years. The accolade may well lead to more international commissions for RCR, although it is unlikely to change the way that Aranda, Pigem and Vilalta work, remaining doggedly attuned to context.